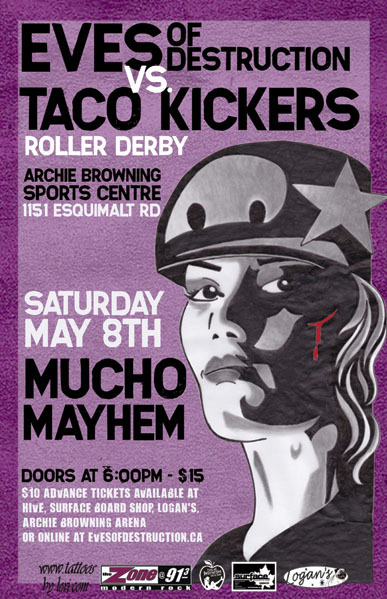 Brett found a babysitter and then got us tickets to see my first Eves of Destruction roller derby bout!! I've been wanting to go see the Eves in action for a while now, but could never make it to a bout due to Brett always having to work past 6pm - when the bouts usually start. Not to mention that we don't have a steady babysitter and I'm not brave enough to go to a bout by myself. Roller Derby! Now that's something I know about! My daughter, the former ice hockey player is in the Derby. Her derby name is Crushin' Dior. She wears ruffles a la Christian Dior with her derby garb! It's fun to watch! I absolutely LOVE her derby name! I love derby in general, definitely so much fun to watch!